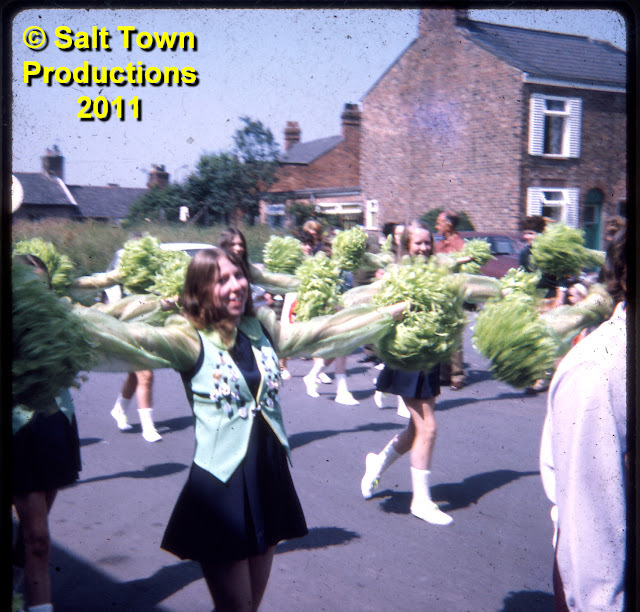 This shot shows one of several dance teams taking part in the 1973 carnival procession and crossing Newton Heath. We've seen in a previous posting that the procession started at the Big Lock and so must have traversed Finney's Lane, Croxton Lane, Chester Road, Newton Bank and Newton Heath. It then turned down Darlington Street, turned right into Wheelock Street and from there onto St Michael's Way, Leadsmithy Street and Lewin Street before branching off at The British Legion and making its way to the Carnival site at the Manor Estate at the top end of Sutton Lane. A very long trek indeed. Notice, in the background, the open space on Newton Heath where 'Digger' Don Niblett would, in later years, build a brand new home and, famously, a short time afterwards, try to demolish it. Long before the FAB Festival - before, even, the original Folk & Boat Festival, there was the Middlewich Carnival which, in its last incarnation, overlapping the 'Folk & Boat' for a couple of years, was organised and run by the Round Table. Middlewich Carnival was legendary. Small town life at its very best, with a pleasing home-made, make-do-and-mend air about it which carried over into the early years of the Folk & Boat Festival but, sadly, has now mostly evaporated. Dave Roberts The facts in the case are simple: Don built a luxury home on Newton Heath (it's still there) and, after a row with his wife, borrowed a digger from work with the intention of knocking the house down. He did a small amount of damage to one corner (where, by coincidence, some of my collection of disco records had been left after a party) and got himself in the national newspapers. Geraldine Williams It was certainly the talk of the town.......! Wasn't the deed done late at night? Gives lie to the saying 'there's no fury like a woman scorned....'! He he! Dorothy Kelly-Hughes I'd forgotten all about that incident Dave!